Over the course of Daniel Craig’s four James Bond films he has been dressed by three different costume designers and tailored by two different brands. Because of this, Craig’s Bond has had an irregular style, and one of the places this inconsistency can be seen is in the cloths his suits are made of. For each of his Bond films, the costume designers had a different approach to the suitings they chose for Craig to wear. 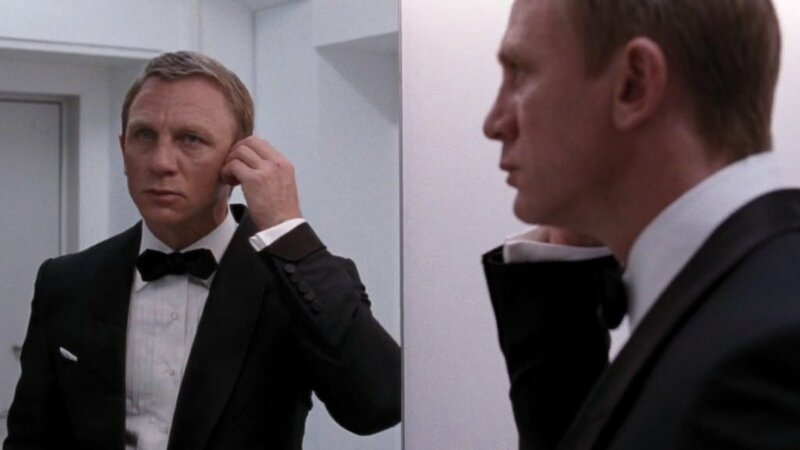 The Bond character has gone back to basics in Casino Royale, and his suitings have become more basic as well. Costume designer Lindy Hemming dressed Daniel Craig mostly in Brioni suits, made of either linen for casual places and warm locales and super worsted wools for his more formal suits and dinner suit. Of the five suits he wears in the film, four of them are dark blue. The one other suit is light grey, which is perfect for Craig’s light complexion. Light blue shirts and blue ties continue the blue theme. Ian Fleming dressed James Bond in a lot of blue in the books, and blue suits or blazers were popular with every film James Bond incarnation. As Timothy Dalton told Garth Pearce in a 1989 interview, “The clothes say so much about Bond. He’s got a naval background, so he needs a strong, simple colour like dark blue.” Hemming only saw a renewed need to stick to this colour. Suits in Casino Royale were solid, striped or subtly checked; Bond did not wear any bold patterns. After dressing Pierce Brosnan in three midnight blue dinner suits, Hemming brought back the basic black dinner suit for Craig to wear in his iconic “there are dinner jackets and dinner jackets” moment of trying on his first proper dinner jacket. Frogley wanted to dress Craig in mohair tonic—a blend of mohair, wool and cashmere, not the cheap synthetic-blend version—to give him a 1960s look. She told Adam Tschorn of the Los Angeles Times about it, “It was extremely popular in the ’60s; all the Mods and all the wannabe Bonds wore it. I’m sure Sean Connery would have worn it at least once.” Sean Connery did indeed wear mohair and wool blends in some of his shinier suits in the 1960s. Tschorn found out from Tom Ford that they made the mohair tonic in an unspecified Italian mill and did not source the original “Tonik” from Dormeuil. Tom Ford did not source all of Craig’s mohair tonic fabrics with their usual Italian mills. West Yorkshire cloth mill Taylor & Lodge takes credit for the mohair and cashmere blend suitings that made up Craig’s midnight blue Tom Ford dinner suit in Quantum of Solace. Their sales director Robert McQullian even compared it to cloths that made up Sean Connery’s dinner suits in the 1960s, though Connery’s likely were not as luxurious as this one provided for Craig’s dinner suits since cashmere in a suit would have been unlikely in the 1960s. All of Craig’s suits in Quantum of Solace are dark-coloured (midnight blue, charcoal and dark brown), which reflects the dark tone of the film and the dark emotions that Bond carries with him throughout the film. The dark fabrics are meant to tell a story about the character, though too much darkness and contrast in an outfit does not flatter Craig’s light complexion. 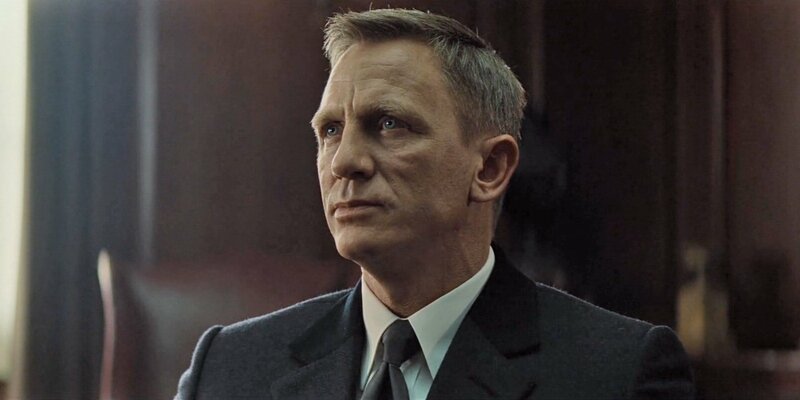 White shirts and very dark suits move away from the brighter blues in Casino Royale that brought out Craig’s blue eyes. The darkness of the suits in Quantum of Solace is slightly mitigated by the sheen from mohair content in the suitings. The classic midnight blue dinner suit, which better matches the tone of Daniel Craig’s skin than black does, returns in Quantum of Solace. For Skyfall, the Tom Ford relationship continued with Bond, but a new costume designer named Jany Temime took the reins. Though the cut she designed for Daniel Craig is controversial, she chose some of the most beautiful yet simple and classically Bondian fabrics from Tom Ford’s collection to make those suits in. These suitings follow what James Bond wore in the 1960s, with three grey suits, one blue suit and one midnight blue dinner suit. The suits are in subtle patters inspired by what James Bond wears in the 1960s films, including sharkskin, glen check, rope stripes and herringbone. All of the cloths are 100% wool in light to medium weights, ranging from 250 to 300 grammes. Despite being 100% wool, the sharkskin suiting has a bit of sheen due to the iridescent nature of tightly weaving black yarns and white yarns together. The S-numbers are not specified by Tom Ford for the wool suitings used in Skyfall, except for the sharkskin suit as Super 110s. Typically when the S numbers are not given, the wool is of less than Super 100s grade, and in this case it is safe to assume that the unspecified wool is lower than Super 110s. Super 110s is still quite low for wools used in high-end suits today (outside of English tailors), but lower S-numbers do not mean lower quality wool, just lower finesse of the individual wool fibres that the fabrics are made from. The cloths used for Craig’s suits in Skyfall are very high quality, just not overly luxurious. That’s perfect for James Bond. 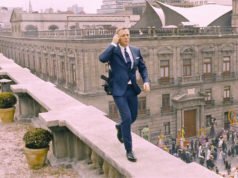 Lower S-numbers means that Craig’s lightweight suitings in Skyfall are heartier and less wrinkle-prone than the high super wools that are more common today. Heartier cloths are especially important for holding up through all the “wear and tear that goes on out there in the field”, and particularly what Daniel Craig puts some of his clothes through in Skyfall. 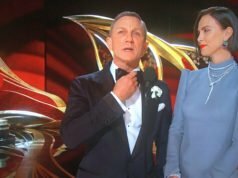 Luxury cloths are completely unnecessary for James Bond, particularly if the luxurious cloths won’t suit Bond’s needs, will go unnoticed on screen or will look worse on screen. Tom Ford and Jany Temime returned for Spectre, dressing Bond in more grey and blue sharkskin, striped, checked and herringbone suits. This time black was introduced for the herringbone suit that Bond appropriately wears to a funeral. The ideas for the suitings in Spectre remained the same from Skyfall, except some fancier cloths were used. The 100% wool and Super 110s wool made up a few suits again, but now two suits in a 70% wool, 18% silk and 12% mohair blend were added to the mix. This unique, more luxurious blend has a bit more sheen than ordinary worsted wool, but it does not come across much differently on screen than pure worsted wool does. The sharkskin suit and herringbone suit, despite being 100% wool, have the most sheen of all of the suits in Spectre due to the weaves. 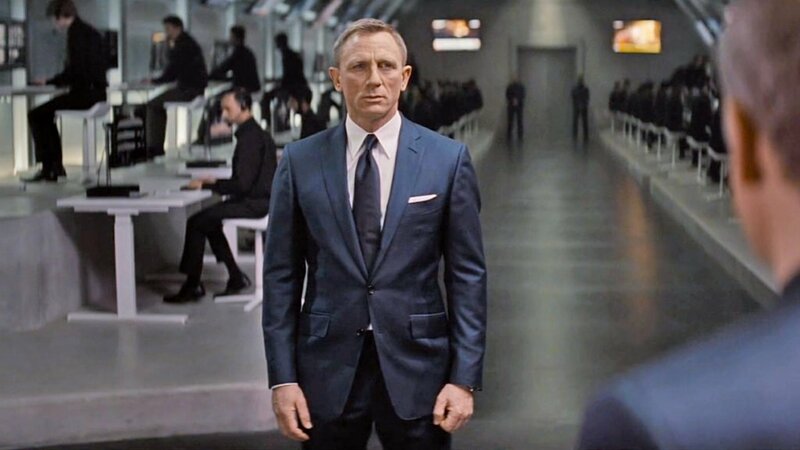 Two of the suits in Spectre are medium blue, though the warming filters in Spectre darken and dull the blue of these two suits. In real life, these two suits in a Prince of Wales check and sharkskin, respectively, are bright enough to bring out the blue in Daniel Craig’s eyes. Though Craig wears white shirts with his blue suits, he wears light blue shirts with his grey suits to also help draw attention to his eyes. For evening wear, the ivory dinner jacket has returned, now in faille made from a modern blend of 56% silk and 44% viscose. Viscose is a type of rayon that is like an artificial silk made from plant fibres. Viscose does not make the fabric lower quality than pure silk, the blend just has different properties. The silk and viscose blend in comparison with pure silk is more flexible and more breathable. In Morocco’s heat with Bond’s need to fight in his clothes, the silk and viscose blend is ideal for both a luxurious look and a practical application. With his dinner jacket, Craig wears black trousers in a wool and mohair blend grain de poudre, a pebbled weave similar to barrathea. The wool and mohair cloth recalls the dinner suits in Sean Connery’s Bond films, despite being in black instead of midnight blue. The odd jacket returned to Bond in Spectre, and the cloth is not the usual fare. In the past couple of decades, blends of more than two fibres in a fabric have become increasingly popular, particularly in Italian tailoring. The fabric of Craig’s jacket from Brunello Cucinelli is made up of 51% wool, 41% linen and 8% silk, which gives the jacket durability and drape through the wool, breathability through the linen and a slightly slubby texture through the silk. In Morocco’s heat, the combination of performance and appearance could not be better achieved by any of the three fibres alone. 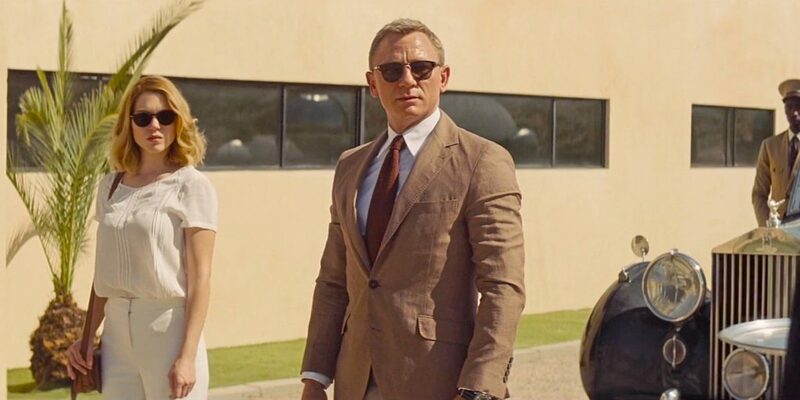 For outerwear in Spectre, Craig has gone more luxurious. The navy herringbone Crombie-style coat is a luxurious blend of 51% silk and 49% cashmere. Though cashmere comes to mind sooner than silk does for overcoats, silk is still a good insulating fibre, and it adds some heartiness to a light and fluffy cashmere. The other coat in Spectre, a black double-breasted bridge coat, is a more pedestrian—but nevertheless high-quality—brushed wool. 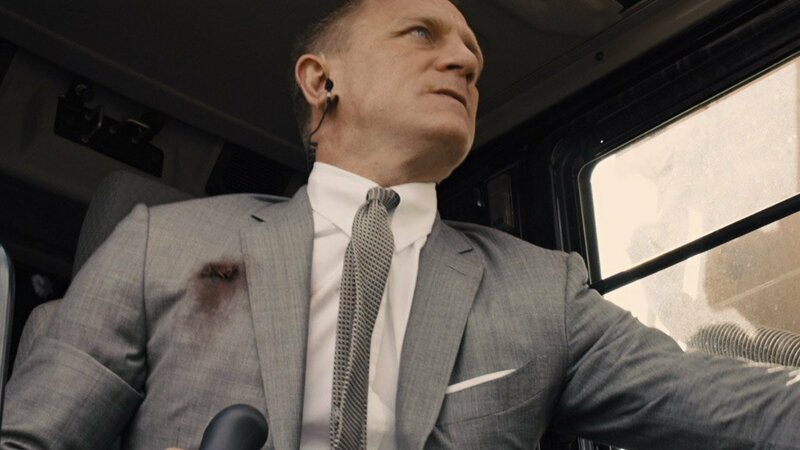 Anyone here think Craig’s dinner suit on the train in Spectre says “rental” ? a)	What’s the difference between “quality” and “luxury” when it comes to suiting (re the Super 110s point)? b)	(since you mention the midnight blue dinner jacket) What’s the difference between midnight blue and true navy? Both seemed to be defined as a blue “so dark it’s almost indistinguishable from black”? a) Quality means something is excellently made. Luxury is something more extravagant and opulent. A quality Super 110s suit will wear well, won’t wrinkle and still look good after 100 wears. A quality Super 180s is more luxurious because it feels better while sacrificing those practical traits. b) Navy is traditionally a bit lighter than midnight blue. Midnight blue may be cooler in hue than navy. 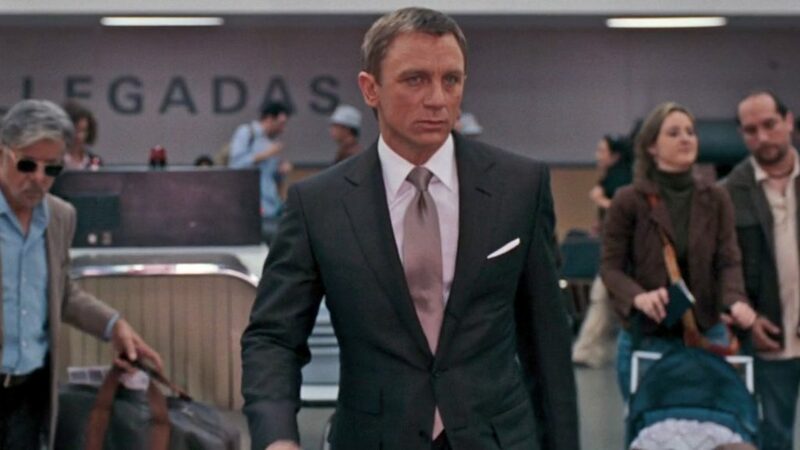 Beginning in Casino Royale, is the audience intended to believe that Bond is wearing bespoke Savile Row suits? Vesper’s comment on the train in Casino Royale certainly suggests this (and although the dinner jacket she gives Bond is in a Brioni garment bag, that obligatory product placement can be explained away because the jacket was Vesper’s selection, not Bond’s). Further, the Tom Ford suits—as you have consistently pointed out—have an overtly English style. And unlike with Brioni, I am not aware of a single instance where a TOM FORD label appears in the films. Rather remarkable given the volume of Tom Ford clothing that has been used. Obviously the connection has been promoted outside of the films, but it is conspicuously absent in the films themselves. I think this theory is plausible. Brosnan’s Suits were obviously Italian, and I think the quotes from Heming that you recently featured reinforce the notion that Brosnan’s Bond, through his clothing, is a man of Continental tastes. Craig’s Bond, on the other hand, seems to be a man of English sensibilities. Most of his casual clothing is English. Moreover, as we know, there has been a concerted effort during Craig’s tenure to adhere more closing to Fleming’s archetype. Certainly Fleming’s Bond would not wear Italian or American suits unless he was in disguise (such as in Live and Let Die). Notwithstanding what we know to be the reality, is it too far of a leap to suggest that Craig’s Bond would approach his clothing in the same manner? So what’s more important the suiting or the company that produced the suit (i.e. Armani, Barbera, etc…)? Generally, it’s the maker of the suit. -That might be right, but with regard to cloth I am a kind of “purist” – in case of doubt I would always prefer pure silk, pure linen etc. to those rather artificial blends. I have no problem to accept those (minor) downsides like pure silk being less breathable and linen rumpling easily. I always want to have the real thing. Is the Cucinelli sport coat the first time Bond wears a keyhole lapel? I know guys who can’t stand them, after all, it’s a popular cost-cutting measure for midrange brands. What’s your opinion? I believe it’s the first keyhole lapel buttonhole Bond has worn. The buttonhole in the lapel on the Brunello Cucinelli jacket is intended to function as a buttonhole with a corresponding button, so that excuses the keyhole shape. Has the back story as to why the costume designers have changed ever been discussed? I realise that sometimes they aren’t available as they’ve been previously contracted for other films but Lindy Hemming was involved for several Brosnan films and CR, Louise Frogley only for QoS, and despite the costumes being broadly admired for that film she never returned and now we have Jany Temime who must shoulder some of the responsibility for the sausage skins of the last two outings. Wonder if she’ll be back for Bond 25? The change in costume designers has no been discussed. Lindy Hemming still has a relationship with EON and has been involved with non-film Bond projects in the past 5 years, such as Designing 007 and Madame Tussauds. I do not know the story behind Louise Frogley. Jany Temime will likely be back for Bond 25 since she has worked with Barbara Broccoli on her latest film. Changes in costume designers likely correspond to changes in directors. The higher profile directors involved with Craig’s Bond films are more likely set on making more of their own choices. I agree that Temime will probably be back. But the costume designer probably won’t be that relevant to Bond’s wardrobe in 25 given the amount of control I believe Craig is likely to exert. That probably means more of the same: too-tight Tom Ford suits made with beautiful fabrics. -I still don’t believe that Craig is in any kind of “control”. He may have some influence, but Temime is clearly at the helm and therefore responsible for the shrunken suits. I am very much in favour of a change of costume designer for Bond 25, but, unfortunately, this is not going to happen. Hopefully it won’t get worse! 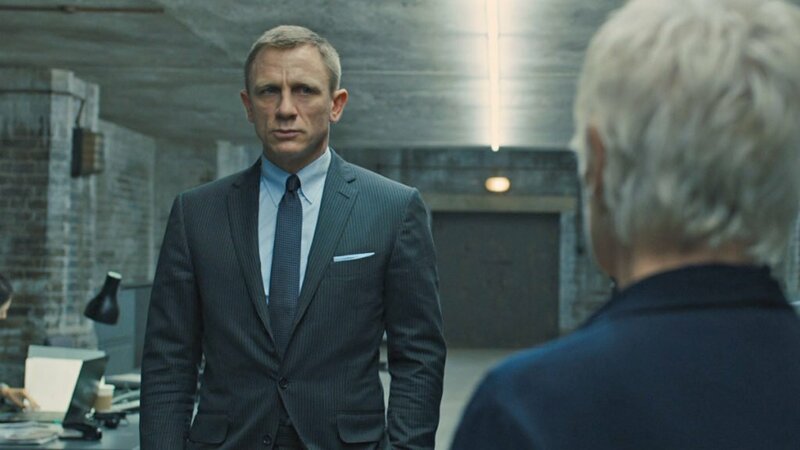 I’ve gone on record many times about how I find the too-tight fit of the suits in Skyfall, and to a lesser extent SPCTRE, which is somewhat of an improvement but still not perfect, distasteful. However, credit should be given where it’s due, particularly in response to this post. Temime’s choices in suitings has been to my eye perfect. As Matt says they’re “beautiful yet simple and classically Bondian.” Though Craig would be well advised to go up one size on his suits, the cloths really are exquisite and the construction of Tom Ford’s suits is superb. As I’ve said before, I think the concept is right but the execution poor. My ideal for Bond 25 would be suits similar to those in Skyfall and SPECTRE but in cuts more like those seen in Quantum of Solace. Just to illustrate what I’m saying, but more than that to brag a little bit, here’s me in the Mexico City blue Prince of Wales suit, which I bought last year when I fortuitously stumbled upon it on sale at a Neiman Marcus (should have smiled for the picture) which is my favorite suit. I also found the three-piece from the final scene of SPECTRE in a Tom Ford outlet earlier this year, but alas it was several sizes too large, which was quite the heartbreaker, that one is another favorite if mine. -I agree, that’s also what I would like to see. But I would rather prefer a bespoke tailor for Bond, f.i. Timothy Everest or Anthony Sinclair. Certainly would not be opposed to that either, I think either of those would be excellent choices, and I’d throw in Richard James as well. Do you think it’s possible for a suit made out of suiting from holland sherry and made by a unknown company to fit well? I ask because I see many suits made with suitings from reputable mills made by unknown companies. It’s certainly possible, but so few companies today know how to make a suit that fits well. Awkward fits are in fashion. If I may follow up? So if a suit is made out of, let’s say a cloth from a reputable mill (i.e. loro piana, zegna etc…) but has an awkward fit, can a skilled tailor make it fit properly? I ask because I saw a client complaining that his suits did not fit properly (He got the three suits three shirts and three neckties for three hundred dollars USD), my tailor was trying to explain to him no tailor in the world can make those suits fit properly because of the cloth. If the cloth is the problem here, perhaps the cloth is too lightweight and fine (like a 7.5 oz Super 180s) to be able to tailor well. These super luxurious cloths are very difficult to tailor. But lots of makers don’t know how to cut a good suit, and this is only partially due to modern trends. Some of these makers might use brand-name cloths. If the fit is a little off but the cut is good, a suit can often be altered. If the suit follows your measurements but is poorly cut, nothing can be done. I brought a pair of trousers with a poor cut to my tailor to see if he could fix it, but he could not. He said because the cut was poor, nothing could be done. It took us a little time to figure out that the poor cut was due to a curved waistband, which has now become a trend. Really? I actually thought the suit in the Quantum of Solace photo was tighter than the suits in the Skyfall and Spectre photos. Except I think I see the “X” on the front of both jackets in the Skyfall and Spectre photos. Well-taken point about the choice of suitings by Temime. This series (Commander of the Cloth) has been excellent – keep up the great work. So just to summarize: Brosnan (and to a lesser extent Craig 1) wore Brioni with a more aristocratic and roman cut (tight but not too athletic, strong roman shoulders). From Craig 2 on the style got much more british but the lightness of construction remained italian (not too much padding, a very close fitting, muscular cut). Can I call the latter “Savile Row style with Neapolitan Construction“? That would not be correct. There’s nothing Neapolitan at all about the suits Bond wears, except for the Neapolitan-inspired Brunello Cucinelli jacket in Spectre. Tom Ford’s dramatic cut and stiff construction in Craig’s last three films is very British. There’s nothing light about Tom Ford’s construction. Brioni is lighter and softer than Tom Ford, even though it is built-up. The tight fit in Skyfall and Spectre does not belong to any school of tailoring, but the shape of the suits with the firm shoulders and a lot of fullness in the chest is British. Hi Matt…I love the website and I can’t stop reading and re-reading everything on it! I have a question regarding the promotional images from ‘Skyfall’ that show a brooding Craig leaning against the Aston Martin…it appears he is wearing the “Istanbul” Tom Ford light grey suit, but the tie appears to be a straight light grey tie in a shade that seems very close to the suit. The tie also seems to be a bit more of a “raw” weave…definitely not the Tom Ford tie we all know and love from the opening Istanbul sequence. Do you have any ideas about what type of tie is shown in this promo image? Thanks for all of your amazing research and the very well done site!